The Conservative Party has been deeply embarrassed by the actions of the Bath Conservative Party when they implied that it was perfectly feasible to feed a family on less than £10 a week?! The conversation on twitter has now been deleted but increasingly shows a party out of touch with the everyday hard working people of the UK. 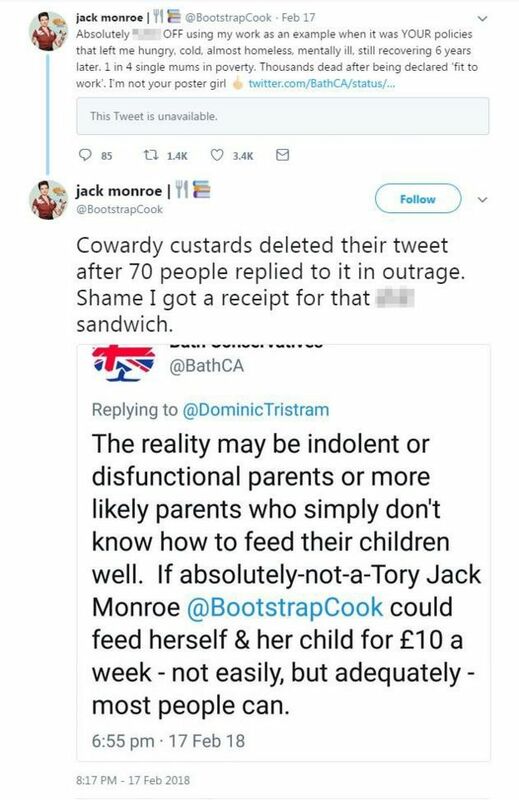 The image above shows the conversation where the local party disagreed with an anti-poverty campaigner called Jack Monroe. Once the conversation started to go viral it was quickly removed and deleted and condemned across the political spectrum for gross insensitivity. Tim Warren the Leader of Tory run Banes Council stated it was an outrageous claim: "This does not reflect the view of my cabinet or the wider Conservative party, sometimes people tweet things which we have no control of. I've got two boys and you can't feed a family for £10 a week." Do you agree we need a better society for everyone? Read: "Diane Abbott opens her mouth"